My short story “Big Mother” will appear in Flyway in mid-April! I’ve been wanting to publish with Flyway because of their environmental focus. Stay tuned! I’ll be reading from my short story “Waves” along with other authors published in Cirque‘s winter issue, Friday, April 10th, 7-9 PM, at TaborSpace in Portland. And in other news, the first death has occurred in my novel-in-progress! More to come! It’s official! 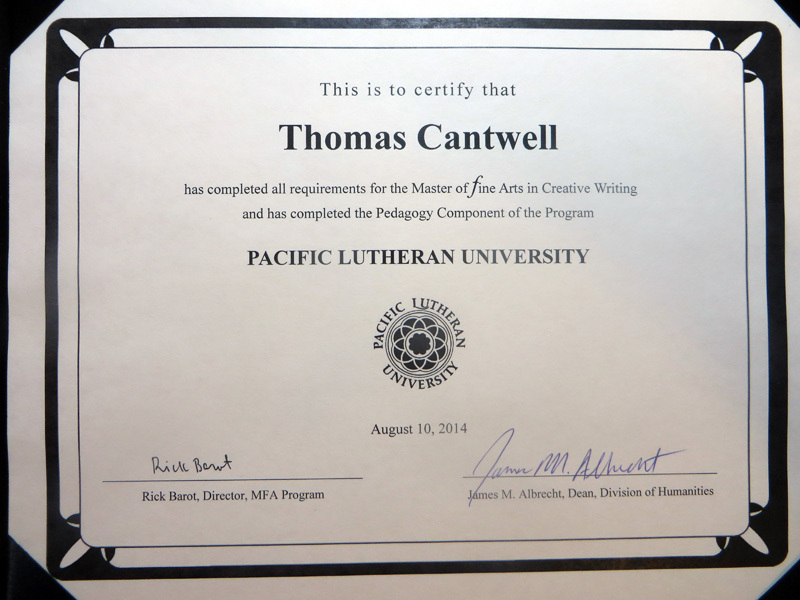 Well, this isn’t the official diploma, but I finished my MFA program at the Rainier Writing Workshop at Pacific Lutheran University. What an amazing three years. I’ve learned so much and made so many great friends. At our graduation lunch, Gary Ferguson spoke about a project he did on nature-oriented creation myths from around the world, and how after reading about a hundred of them, he noticed three common elements: beauty, community, and mystery. He suggested that these are things we should focus on in our lives and in our writing. Sounds about right to me. Just a day after posting my first blog on my new site here, I got an e-mail from Newfound accepting my short story “Dunes” for an upcoming issue! Super psyched. One goal I had in my MFA program was to publish three stories before I graduate, and I’ll graduate in exactly two weeks, so that’s cool. Newfound is a great online journal, and I look forward to working with their editor on my story. This is my first post on my new website! I operated cantwellbooks.com for over ten years, but I was having some software and server issues over there and decided to start fresh with tomcantwell.net and run it all through WordPress, which I’m very happy with so far. (The domain registration and hosting here only costs $26 year!) This move also enables me to finally move into Web 2.0 and have an interactive site instead of a static one. I’m not sure where all this will lead, but I’m excited to find out! Much of the content from my old site has carried over, though the focus now is more exclusively on writing, which is where most of my focus is these days outside of teaching and family. To sum up what’s been happening with the writing since I last posted on my old site, I’ve spent the last three years working toward my MFA in Creative Writing from the low-residency Rainier Writing Workshop at Pacific Lutheran University. I graduate on August 10th! It’s been a ton of work but totally worth it. Participants complete the program with a creative thesis, a book-length manuscript. Mine is called Earth Names: Stories from Cascades to Coast, a collection of nine short stories set where I live in Central Oregon and loosely linked with recurring characters and plot elements. I’ve begun submitting the stories individually to literary journals, and one of them, “Country Fair,” has been accepted so far. It will appear in the fall or spring edition of Weber-The Contemporary West. I plan to write one more story for the collection, which I will probably begin submitting as a whole in a year or so. I hope to begin working on a novel this fall. That’s my plan, though it must be said that Rilke wasn’t much of a father or husband! I expect the next three years to be as busy as the last three, balancing work, family, and this necessity to write. I wouldn’t have it any other way. I’m posting all my blogs from my old site here, all those entries that nobody could comment on. Here’s to starting something new!